Detailing the physical features, habits, territorial reach and other identifying qualities of the Carolina Tiger Beetle. Large jaws, metallic coloring and stark white legs make the Carolina Tiger Beetle a real standout and a popular addition to collector showcases. Carolina Tiger Beetles are bright and colorful, therefore they are collected and killed for display, a practice also implemented with butterflies. The metallic, emerald green body is gem-like. The top part of the dorsal (back) side has a reddish-copper gleam. A large white dot at the end of the body marks the bottom edge of each elytron (wing covering). To all that, add bright white antennae, legs and mouth parts. It is a rare color combination and that attracts many beetle and bug collectors. This collecting by humans, coupled with habitat destruction, has led to a decrease in Carolina Tiger Beetle numbers and dispersion. 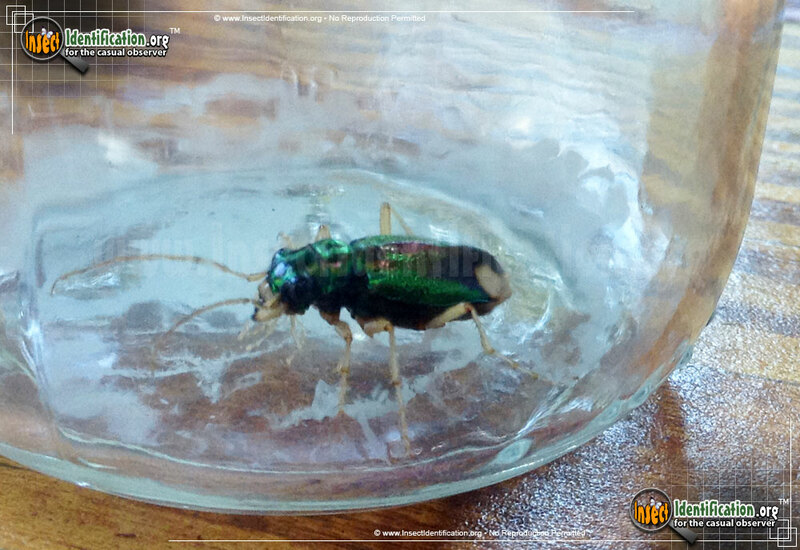 The Carolina Tiger Beetle is a ferocious predator of many pest insects, so having healthy populations is beneficial. As adults, these predatory beetles consume many insects that humans consider a nuisance: spittlebugs, flies, caterpillars, spiders and ants. This particular species may be considered a natural turf-protector. A study showed it consumes insects that are known to kill the short grass seen on pitches, football fields, and golf courses.The hunting style of this beetle accounts for its 'tiger' moniker. Larvae are worm-like creatures and they reside in vertical tunnels, latching onto the side of the burrow with a hook-like feature on their body. They wait, with their mighty jaws at the surface of the hole. When an unaware insect walks over it, the larva quickly clamps its jaws on the insect, drags it down into the hole, and eats it. To be successful at hiding and hunting, larvae need undisturbed soil or sand. Human foot traffic, ATVs, bikes and other off-road vehicles destroy both the burrow and the insect living in it.